This System was designed as a grid tie system. 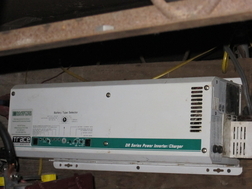 The installer needed to AC Couple to a DC Inverter. We came in and Solved this Issue. Notice the Addition of Charge Controllers, Breakers, Lightning Arrestors, & Progress. THIS IS A GRID TIE TO OFF-GRID TRANSFORMATION STILL IN PROGRESS. OFF-GRID SYSTEMS TAKE TIME TO DESIGN, ACQUIRE ALL COMPONENTS, & INSTALL & COMMISSION. WE FIELD TEST THESE SYSTEMS IN THE REAL WORLD! Each Slideshow is a Different System. MC4 CABLES IN ANY LENGTH UP TO 100' MC4 Y CONNECTORS. MC4 INLINE FUSES. MAGNETIC BREAKER SWITCHES, DIODES & DIGITAL VOLTMETERS. Solar Heater Warms Air to Heat House. Mike Daniels Contribution.